Unfortunately, after the crazy happenings of last year, we skid (get it?) back to the X-Factor complex and every day life. Around the lunch table, the fledgeling members of the rehabilitation program are discussing the merits of X-Factor’s benefits to humanity. Sure, they rid the city of the Horsemen, but they left Central Park in a frozen shambles! There is a lot of swinging this issue between Rictor and Rusty, mostly revolving about this and what Iceman said to Rictor previously about “you shall know a mutant by his deeds.” It was taken to heart, and Rictor’s reaction to it got to Rusty’s heart. Rusty decides to race to Central Park to melt some of the ice from the trees and such. He gets mugged in the process (after some loose snow falls on him) but he’s saved by his new friend. 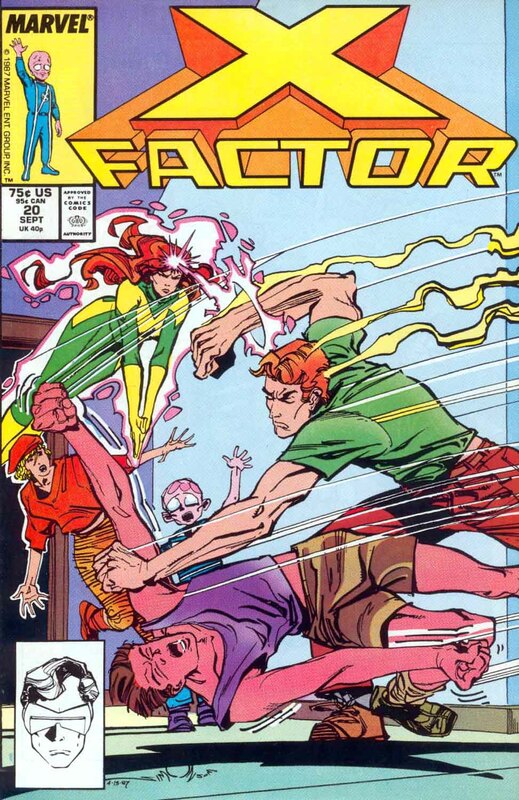 Rictor uses his powers to shake the trees of their snow, while Rusty melts it. With all the media coverage mutants are getting lately, they decide to use the ice to their advantage, mocking up Iceman’s encouragement in ice.